Travel, Workout & Explore With the Most Absorbent, Soft & Fast Drying Microfiber Towel Set! Tired of carrying around thick and heavy towels? Looking for a softer alternative to traditional sports towels that's gentler? Want something that can absorb sweat and water faster? If yes, then our Microfiber Towel set is exactly what you need! Large in size, light in weight and soft on the skin this microfiber sports, travel and camping towel set is a must-have for anyone that wants to stay fresh and sweat free around the clock! It's safe to use for babies to adults and provides unmatched absorptions and comfort! Anti-Bacterial, Lightweight & Super Absorbent - Perfect For Every Occasion! We only use the highest quality microfiber material to make our gym and workout towel which is why it not only absorbs more water than traditional towels but also absorbs 10 times faster than normal towels! This yoga towel set is lightweight, compact and features powerful anti-bacterial properties that allow you use it anywhere you want without having to worry about odor or bacteria buildup making it perfect for travel, gym and camping! Click on the Add To Cart button now to order today to stay sweat-free around the clock with our pack of 2 Super Absorbent & Quick Drying Microfiber Towels! 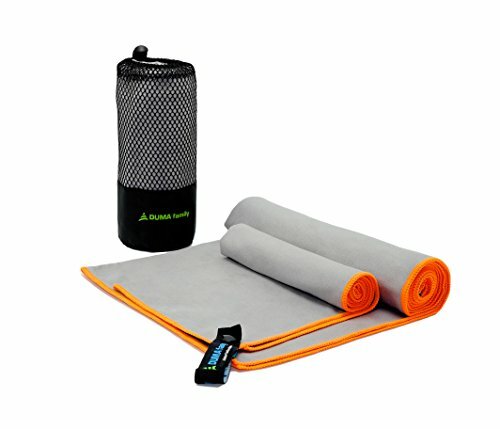 ✔ SUPERIOR QUALITY & COMFORT: This Soft, comfy and long lasting Microfiber Towel Set is made to provide you with a lightweight and super absorbent sports towel with powerful quick drying and moisture wicking properties to absorb water and sweat to help you stay cool and dry around the clock. Whether it's at the gym or at the beach, you can count on our microfiber towels to keep you water and sweat free. ✔ PERFECT FOR TRAVEL & SPORTS: With an incredibly soft texture and anti-bacterial properties, this microfiber travel towel provides unmatched comfort while preventing the growth of mildew, bacteria and germs to keep you dry and safe. Thanks to the anti-bacterial properties, it also prevents the growth of smell promoting bacteria ensuring you stay fresh around the clock. Each pack includes a 47x20" (120*50cm) microfiber towel and 19x13"(50x35 cm) microfiber towel. ✔ QUICK DRYING & HIGHLY ABSORBENT: Made using high quality 100% microfiber that is almost as soft and smooth as silk, our sports towel is super absorbent, quick drying and holds up to five times its weight in water to provide you with a fast, reliable and comforting way to stay dry around the clock making it perfect for long sweat-inducing workouts or having fun at the beach. ✔ EASY TO CLEAN & EASY TO CARRY: Whether you're looking for a Beach Towel, Travel Towel, Sports Towel, Gym Towel, Bath Towel, Yoga Towel, or Workout Towel you can count on our pack of 2 microfiber towels to get the job done! This towel set is lightweight, compact and comes with a travel bag allowing you to take it wherever you go as well as being machine washable making it convenient to carry and wash.
✔ 100% RISK-FREE PURCHASE: Customer satisfaction always has and always will be our top priority which is why we go the extra mile to acquire the highest quality microfiber to provide our customers with durable and long lasting travel towels. We're so confident that you'll love this set of 2 microfiber sports towels that we offer a 100% Customer Satisfaction Warranty so that you know you're getting the best the market has to offer. If you have any questions about this product by Duma family, contact us by completing and submitting the form below. If you are looking for a specif part number, please include it with your message.